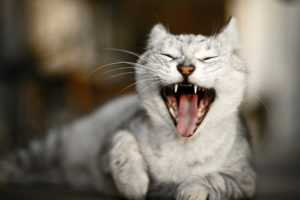 Your cat will very likely tell you that only dogs drool, but that isn’t entirely truthful. Cats drool too, often because they’re happy. A cat being petted can be so blissful it forgets to swallow. A cat devouring a particularly tasty treat may drool for the same reason humans do. Drooling can also be caused by anxiety, for instance if your cat is about to see the vet, or knows it’s about to get some medicine it doesn’t like. If your cat drools constantly, or if it also has watery eyes, it’s time to see a veterinarian. The drooling could be caused by a health issue that needs to be addressed.